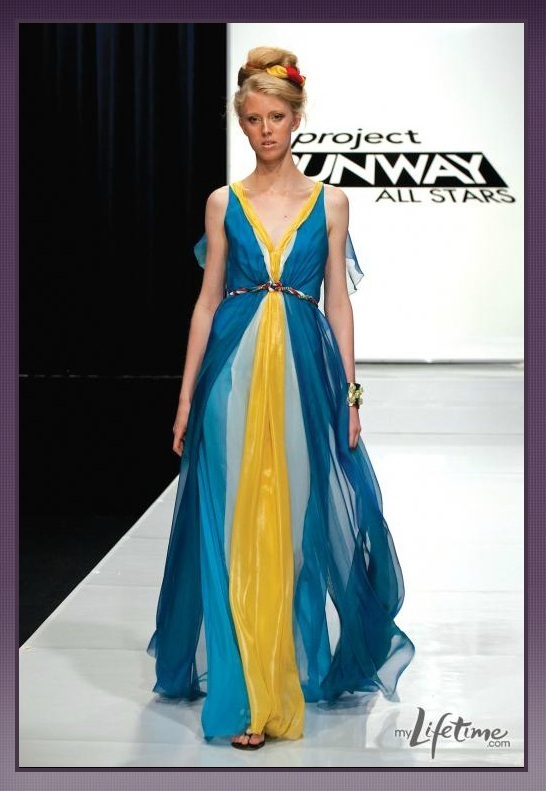 Project Runway All Stars Episode 8: O! Say, Can You Sew? Ah, a REAL challenge this week! I am so excited that the producers of Project Runway All Stars are bringing in some really new and unique challenges. This week they tasked the designers to use the flag they selected at the United Nations headquarters as their inspiration for their dress. From just watching the selection process of who picks what flag, it’s really refreshing to see who looks for something new and out of their safe zone, and who would rather stick in their comfort zone. I wish the judging process was a little more, what is the word I want to use…..clear? As the challenge description states, they have to “choose flags as inspiration for beautiful dresses”. The FLAG. Not the country, the FLAG. Obviously the country’s cultural aspect needs to at least cross your mind, but I really truly got the impression it was the FLAG that was supposed to be the main source of inspiration. I think that’s why some designers went and color matched fabrics to some of their flag colors, others turned their dresses into conceptual or theatrical designs. I thought Jerell’s interpretation was perfect for India, and seeing as how that’s along the line of what they wear, I really don’t understand how that is considered costume – y . But oh well. I like it! Talking about the lines of costume looking, I think Austin’s dress was more along those lines with those colors. Those colors, I think, are what really set it over the edge; however I can see how it’s flow-y and pretty, and could be worn. Just not by any girl for any summer occasion. In concept it was a cool idea I think. Michael. I really don’t like the guy, but he does make good dresses. Was this week’s dress his best ever? No, not by a long shot. Did it look more like a costume than anyone else’s? Absolutely. 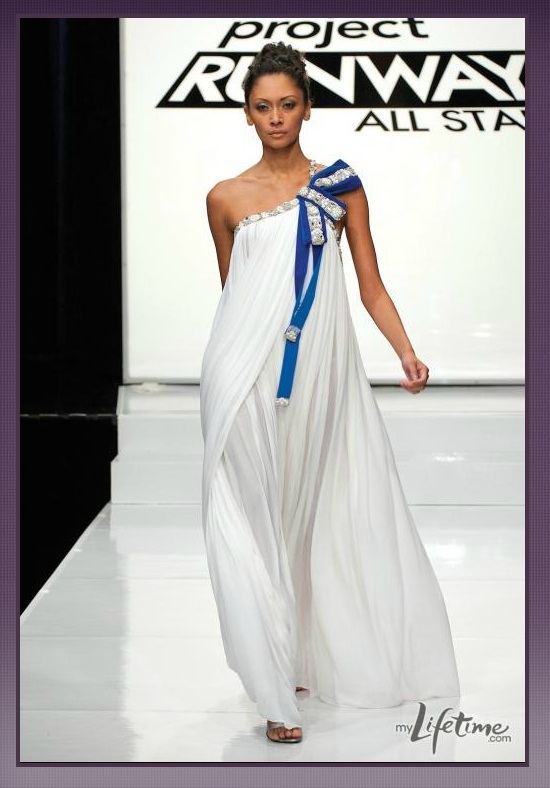 BUT it had the foundation to be a gorgeous draped gown. I think the problem with white, and it being a Greek dress, is that its either going to look like a Greek Goddess costume, or a white draped wedding gown. Neither is really ideal for a Project Runway All Stars challenge. Mila, I know you are never going to read this, but seriously girl, I give you credit for sticking to your design aesthetic. You were bold, did you what you though was appropriate, and they can’t knock you for it. You go girl! My week’s favorite was Mondo’s Jamaican black dress. It was simple, black (which I love!) and still represented the Jamaican flag without being too conceptual, costume looking, or just way off the charts like Kenley. (WTF is that girl thinking!?) I’d wear it! Though I think I’d probably need a bra. Oh well, I can dream!! Did you see the teaser for next week’s episode? I cannot wait to see what the designers are doing with LED lighting and lights on their designs! Too cool! And that whole “After the Runway” show? Not sure what that was about, sounds like a smack – talking filled half hour to me!